Chinese cranes and pine tree design in the shape of Chinese character for "Longevity". 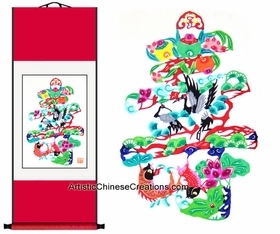 In the Chinese culture, the cranes and peaches symbolize longevity, the pine trees symbolize longevity / eternal youth and steadfastness; the bats symbolize good fortune; the fishes symbolize prosperity and wealth. Lotus symbolizes purity, joy, and perfection.